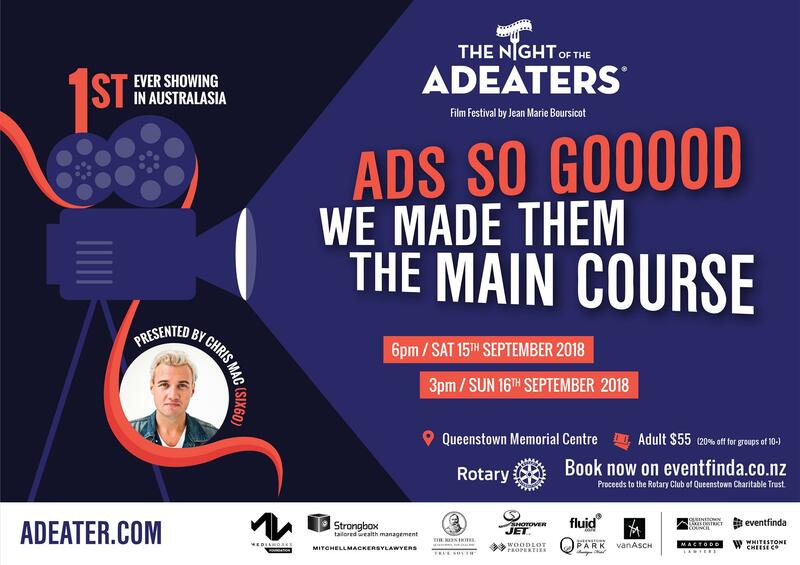 The New Zealand premiere of The Night of the AdEaters is coming to town - Ads so good we made them the main course! This is an evening like nothing you’ve experienced before! Spend an evening watching nothing but the cream of global TV and cinema ad production. In 172 cities across 52 countries, 12 million viewers have watched amazing, intriguing, shocking, and funny commercials, representing the creativity, passion and trends in the world of advertising since its inception. Our show will be as funny as it is creative, exotic and artistic; in short, The Night of the AdEaters, Queenstown, promises to be one incomparable cinematic experience! Hosted by Chris Mac of Six60, and supported by magician Jonathan Usher, the evening features some great Central Otago wines & food options. With the ads starting at 7.00pm Saturday 15 September and 4.00pm Sunday 16 September, this event runs in three one-hour segments with intermissions. Doors open at 5.30pm Saturday and 2.30pm Sunday - wine, food, music and magic from 6pm and 3pm. So, Rotarians and Friends of Rotary, grab a group of friends and/or business associates for a different fun night out! Bust out the popcorn and get ready for a night to remember! Dress to reflect your all-time favourite ad and be in to win one of our great prizes! Use the links below to find out more about Adeaters and book directly with ‘Eventfinda’.